The word “gene” was defined in 1909 by Danish botanist Wilhelm Johannsen as the fundamental physical and functional unit of heredity. The word was derived pangenesis used by Darwin (1868) The word pangenesis is made from he Greek words pan and genesis (“birth”) or genus (“origin”). Classic I Genetics and evolutionary biology use the term for unit of inheritance. The modern definition of gene is as gene is a region of genomic st pence, corresponding to a unit of inheritance, which is associated with regulatory regions, transcribed regions and other functional sequence regions. (b) Translation: mRNA is translated by specialized cellular machinery known as the ribosome into a polypeptide chain. These polypeptides chains fold upon to form functional protein molecule. I. Genes govern the activities of cells through the proteins they encode. In multicellular organisms. 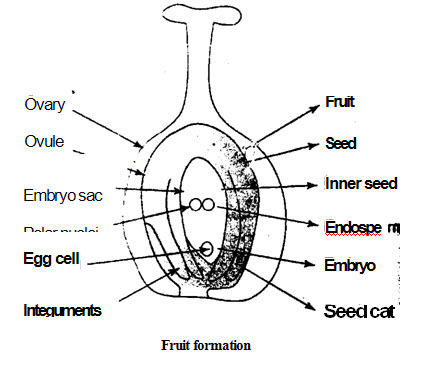 they control the development of the individual from the fertilized egg. They also control day-to-day functions of the cells that make up tissues and organs. Their protein products give mechanical support to the cell structure. These proteins are also involved in the transportation and manufacture of other molecules and the regulation of other proteins’ activities. Four kinds of sequentially linked nucleotides compose a DNA molecule or strand (more at DNA). These four nucleotides constitute the genetic alphabet. A sequence of three consecutivenucleotides. called a codon, is the protein-coding vocabulary. The sequence of codons in a gene specifies the amino-acid sequence of the protein it encodes. In most eukaryotic species. very little of the DNA in the genome encodes proteins. The genes are separated by vast sequences of junk DNA. Moreover, the genes are often fragmented internally by non-coding sequences called introns. lntrons can be many times longer than the coding sequence. humus are removed after transcription by splicing. The coding regions of the gene are called exons. (a) The DNA strand is expressed into a trait only if it is transcribed to RNA. Transcription starts from a specific base-pair sequence (a prom..zer) and stops at another (a terminator). (b) Cells regulate the activity of genes in part by increasing or decreasing their rate of transcription. Over the short term, this regulation occurs through the binding or unbinding of proteins. known as transcription factors. to specific non-coding DNA sequences called regulatory elements. (C) The RNA is edited before its translation into a protein. 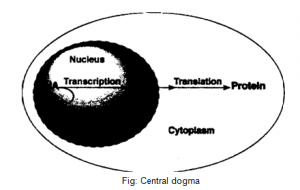 Eukaryotic cells splice the transcripts of a gene. It keeps the exons but it removes the ‘rams. (e) Once produced, the protein interacts with the many other proteins in the cell, according to the cell metabolism. This interaction finally produces the trait. I. The existence of genes was first suggested by Gregor Mendel in the 1860s Although he did not use the term gene. he explained his results in terms of inherited characteristics. In 1910. irhomas Hunt Morgan showed that genes are present on specific chromosomes. Ile later showed that genes occupy’ specific locations on the chromosome. In 1928, Frederick Griffith showed that genes can be transferred. In his experiment. Griffith inject heat killed gene of virulent bacteria into mouse. It changed non virulent bacteria into virulent one. In 1941, George Wells Beadle and Edward Tatum showed that mutations in genes caused errors in certain steps in metabolic pathways. This showed that specific genes code for specific proteins. It is called one gene, one enzyme hypothesis. Oswald Avery, Collin Macleod, and Maclyn McCarty showed in 1944 that DNA holds the genes information. In 1953, James D. Watson and Francis Crick demonstrated the molecular structure of DNA. Together, these discoveries established the central dogma of molecular biology. It states that proteins are translated from RNA which is transcribed from DNA. Richard Roberts and Phillip Sarp discovered in 1977 that genes can be split into segments. This leads to the idea that one gene can make several proteins.